If you are so lucky to be graced with the honor of being a resident of the state of Missouri, than you have been enjoying some of the ugliest summer weather that I would never wish for. It has been eerie, gloomy, cold and wet. Not exactly swimming weather. All of this the weather's unstable emotions has had a negative impact on my "allergies." Not that I really have allergies, but I don't really know what to call it the cold like nastiness congregated in my sinuses at the moment. All I really know is soup always comforting in a time of need. So here we go. OR-Do it yourself! Place 3 red bell peppers under the broiler. Make sure they are within a few inches of the burner. We want to char the skin. It will be black, blistery and will pull away from the flesh when it is done. Somewhere around 10 minutes. Just keep your eye on it. Next, let it cool before trying to pull off that skin. You may want to place it in an ice back to hurry up the process. Rub your hands pepper and the skin should come off. Next remove the stem, the seeds and get rid of that nasty white membrane on the inside. 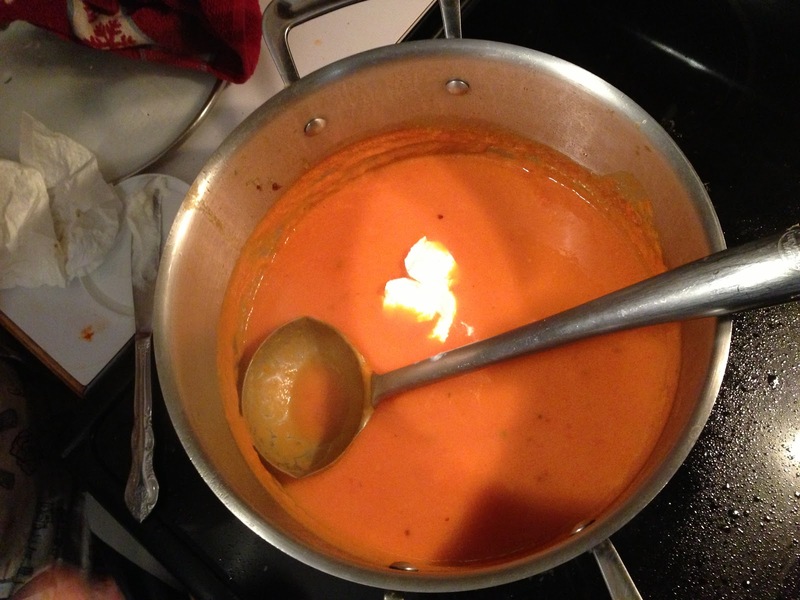 In a medium to large stock pot heat the oil over medium heat. Sauté the onions, garlic and potato (Seasoned with S&P of course) for 10 mins or until the potatoes and onions begin to soften. Add the bell peppers, cumin, and oregano continuing to cook for another 3 minutes. Add the chicken stock to the pan, reduce the heat to med low-just enough heat to allow the soup to simmer- and cover the pot. Allow to simmer away for at least 20 minutes. After the flavor awakening from the bubbling is complete, now is time for the blending. You could use a blender, food processor or an immersion blender. In this case I used my food processor and it turned out nicely. Just make sure to not over fill the food processor or blender. We want the soup to end up in our mouths, not the floor. No explosions are need. 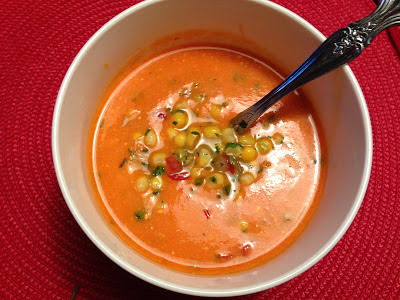 After the soup is nice and creamy, you may add the sour cream or heavy cream to give the puree a more velvety texture, but the decision is totally yours. 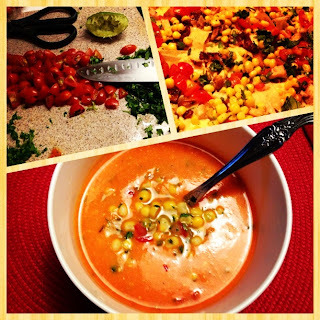 Serve with corn salsa and enjoy!